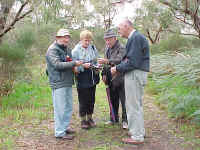 The heathland is the most intact plant community in Braeside Park, having the least amount of weed invasion. It is zoned as a conservation area in the master plan so access is limited. Permission to enter can be obtained from the ranger. 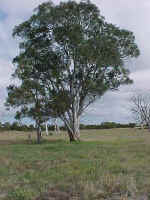 The River Red Gum (Eucalyptus Camaldulensis) and grassland area covers 75 hectares and is considered to be of significant conservation value. Few examples of this vegetation type remain in metropolitan Melbourne. There is a high proportion of introduced grasses, principally pasture grasses, in this area due to the fact that it has a long history of cattle grazing. Patches of the indigenous Kangaroo grass (Themeda triandra), which would have once dominated the understorey, and scattered orchids, remain in this area. The wetland area covers 40 hectares in the south west corner of the park. It consists of herbaceous natives and introduced plant species. This plant community provides essential habitat for water dependent birds. Water couch and other grasses fringe much of the wetland area and there are also patches of rushes and reeds. These provide protection for nesting birds and their young. Last updated: 02 April 2018.